ments, regardless the studied disease or test result. to non clinical scores a year after PST disclosure. son will develop the symptoms of the disease [2,4]. isciplinary approach for HD, PAF and MJD PST. laboratory techniques for mutation detection [5,6]. leading these patients for a progressive limitation [11,12]. 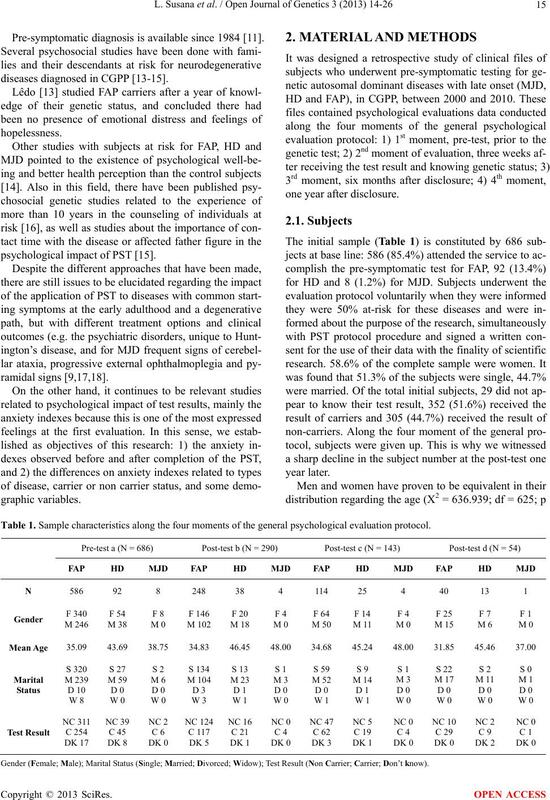 Pre-symptomatic diagnosis is available since 1984 .
diseases diagnosed in CGPP [13-15]. 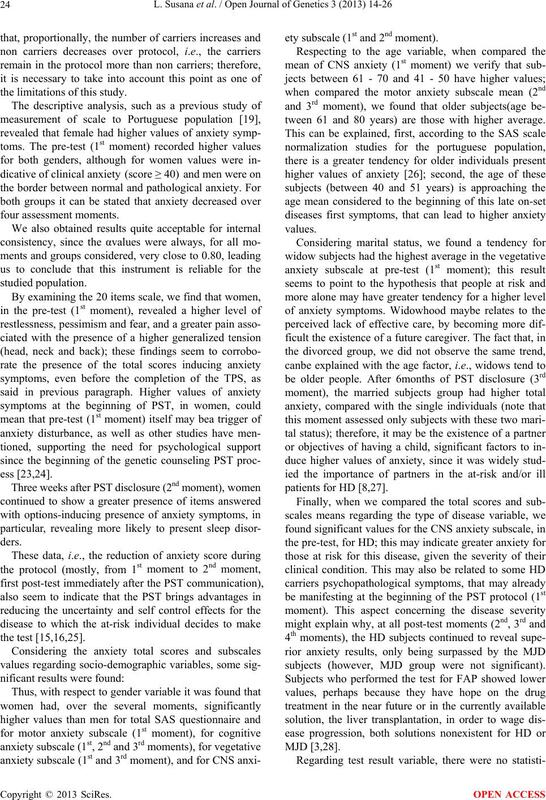 psychological impact of PST . Table 1. 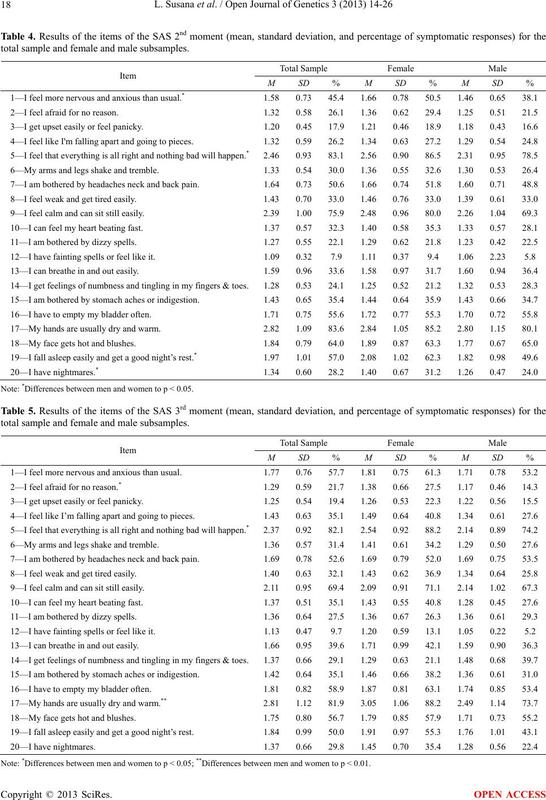 Sample characteristics along the four moments of the general psychological evaluation protocol. Gender (Female; Male); Marital Status (Single; Married; Divorced; Widow); Test Result (Non Carrier; Carrier; Don’t know). and test result (X2 = 2.446; df = 2; p = 0.294). in CGPP have been published elsewhere . tween 20 and 80 and the cut point is 40 .
moments, women had always higher averages than men. men and have higher sleep disturbance (Table 4). less than 0.05 (see Table 7). 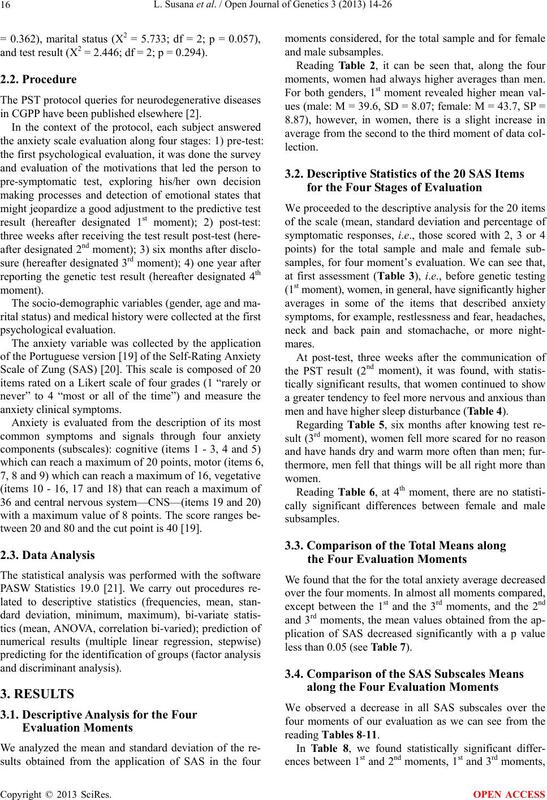 ments regarding cognitive anxiety subscale. 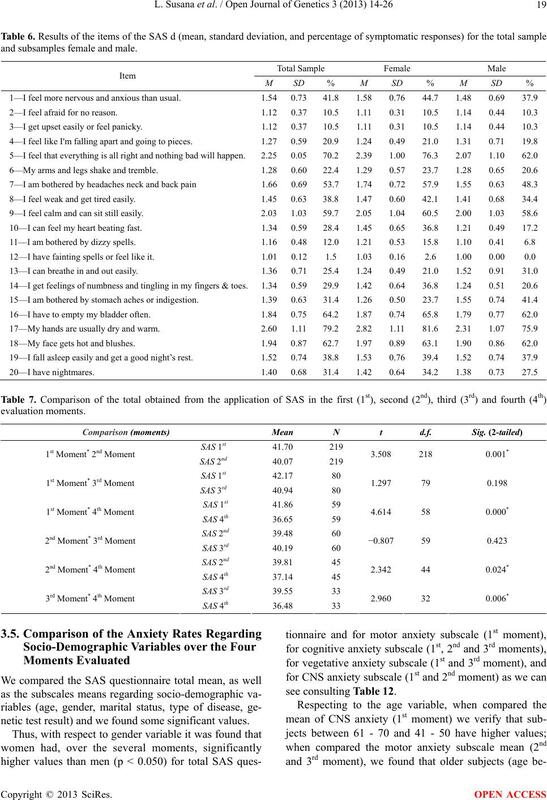 ments regarding CNS anxiety subscale. total sample and female and male subsamples. 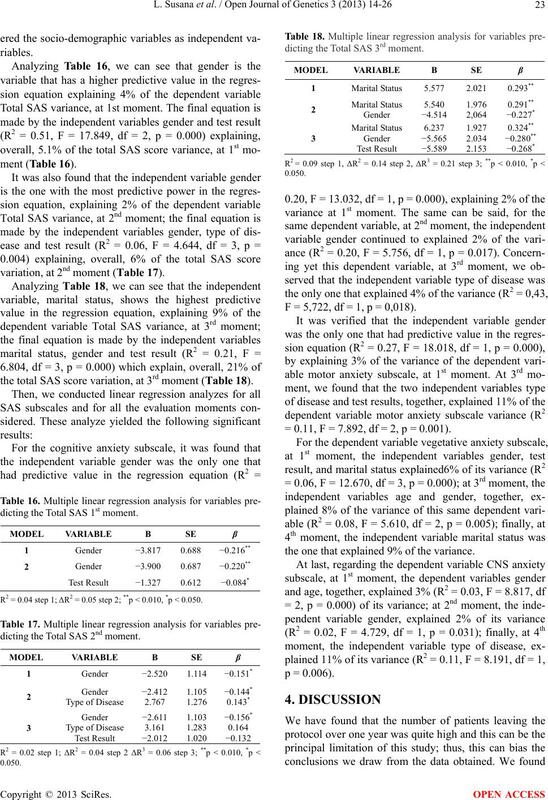 Note: *Differences between men and women to p < 0.05; **Differences between men and women to p < 0.01. 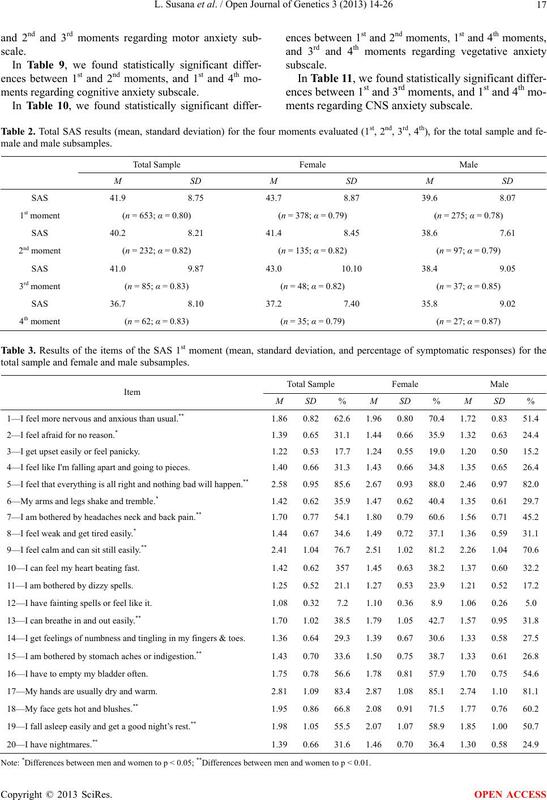 Note: *Differences between men and women to p < 0.05.
and subsamples female and male. netic test result) and we found some significant values. Table 12. 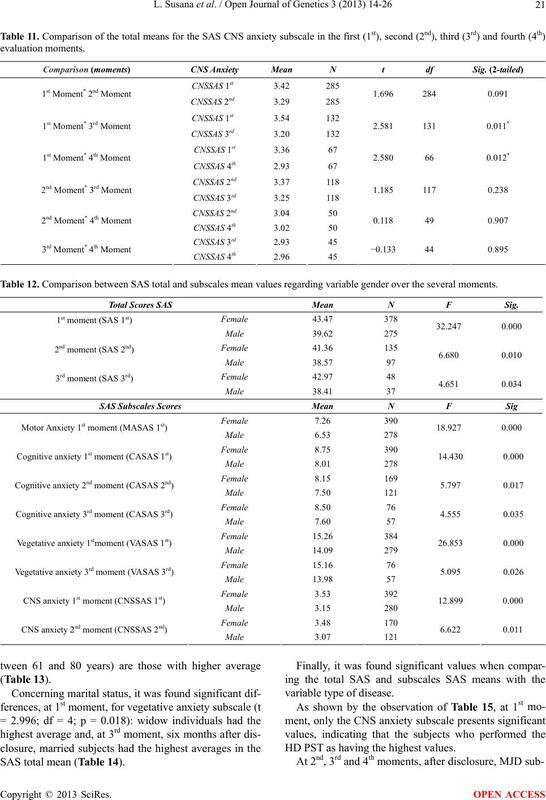 Comparison between SAS total and subscales mean values regarding variable gender over the several moments. Total Scores SAS Mean N F Sig. 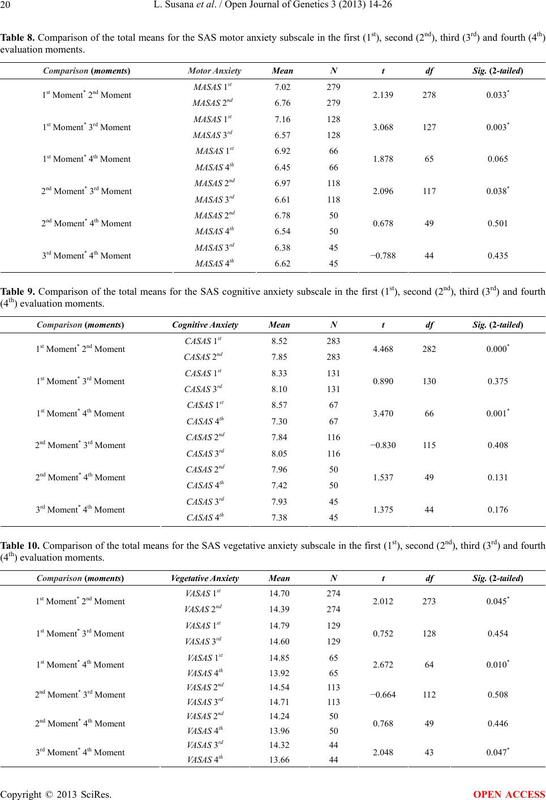 SAS total mean (Table 14). HD PST as having the highest values. Table 13. Comparison between SAS total and subscales mean values regarding variable age over the several moments. Moments Subscales Mean N F Sig. Table 14. 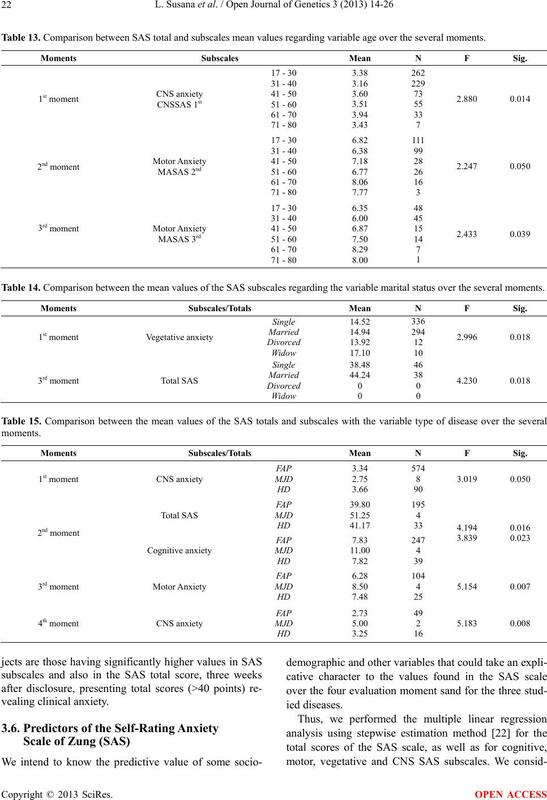 Comparison between the mean values of the SAS subscales regarding the variable marital status over the several moments. Moments Subscales/Totals Mean N F Sig. variation, at 2nd moment (Table 17). the total SAS score variation, at 3rd moment (Table 18). dicting the Total SAS 1st moment. R2 = 0.04 step 1; ΔR2 = 0.05 step 2; **p < 0.010, *p < 0.050.
dicting the Total SAS 2nd moment. dicting the Total SAS 3rd moment. F = 5,722, df = 1, p = 0,018). = 0.11, F = 7.892, df = 2, p = 0.001). the one that explained 9% of the variance. the limitations of this study. ety subscale (1st and 2nd moment). tween 61 and 80 years) are those with higher average. subjects (however, MJD group were not significant). toms; widows also had the highest anxiety scores. 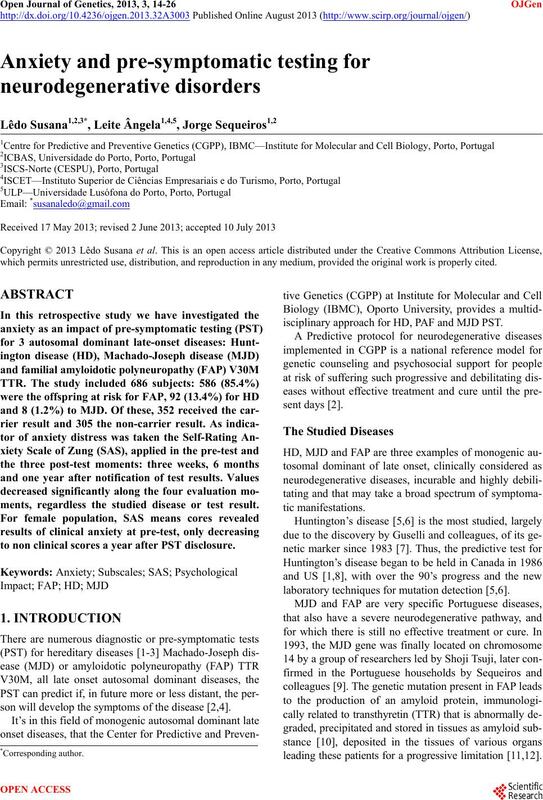 pean Journal of Human Genetics, 5, 351-363.
ington’s Disease. Health Psychology, 16, 36-50.
partners. Health Psychology, 16, 20-35. Lêdo, S.O. (2002) Primeiro dia do resto de suas vidas. disease, kinship and gender of the transmitting parent. 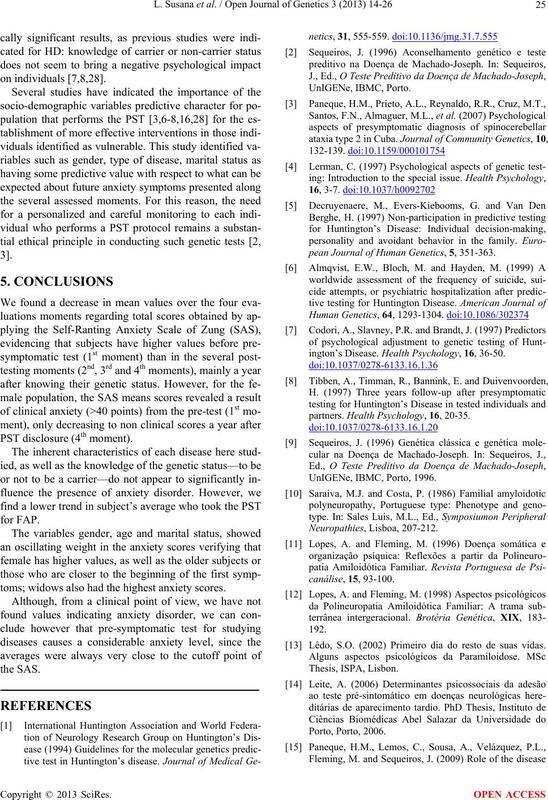 Journal of Genetic Counseling, 18, 483-493. 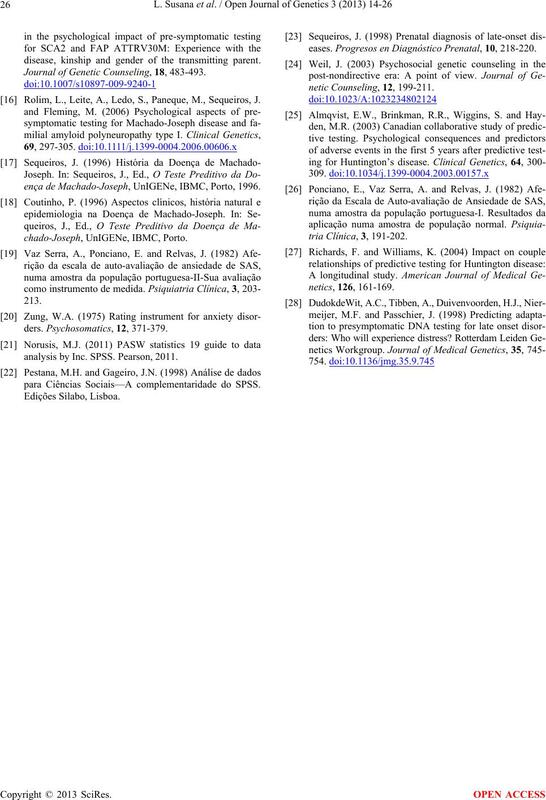 Rolim, L., Leite, A., Ledo, S., Paneque, M., Sequeiros, J.
ença de Machado-Joseph, UnIGENe, IBMC, Porto, 1996.
analysis by Inc. SPSS. Pearson, 2011.
para Ciências Sociais—A complementaridade do SPSS. eases. Progresos en Diagnóstico Prenatal, 10, 218-220.